Why are monarch butterflies declining in the West? How much has the whole population declined? Western Monarch butterfly populations are much smaller and less studied than the ones at the East Coast. They spend several generations at California coasts and move then inland towards Rocky Mountains. 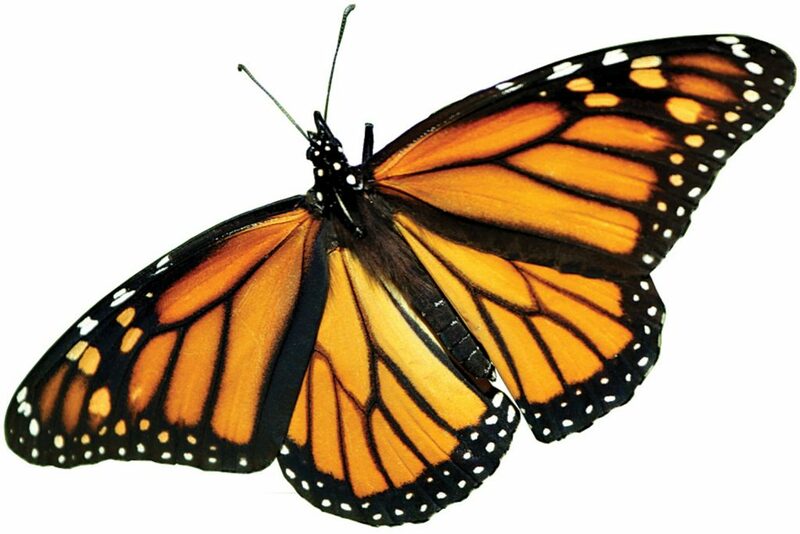 Monarch butterflies are just awesome because their migrations include several generations. While the grandparents might have been born at the coast, their grandgrandchildren decide to fly somewhere else. The same cycle repeats many generations later. Elizabeth’s talk was about the population in the West only! In Central California there are volunteers, CITIZEN SCIENTISTS, who count butterflies every year around Thanksgiving. In 1997, there was a very high count, then only smaller numbers. Had numbers before 1997 been consistently higher? There were no citizen scientist projects back then. Elizabeth had to collate data from different research groups. She found quite a lot but nothing was standardized. Everybody had used different approaches. Hence, Elizabeth had to apply some statistical models to account for all this variation. She did MARSS modeling and analyzed a very long time series. 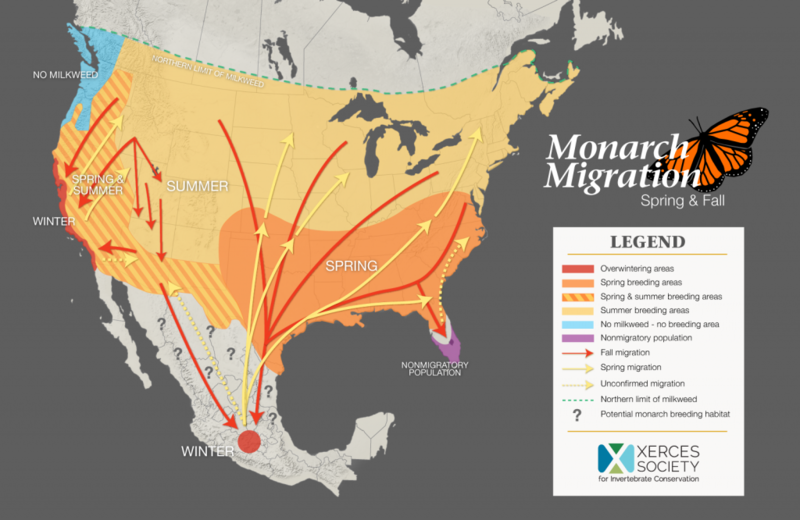 This model assumes that monarchs function as a single large population in the west, with a single growth rate. For each site she estimated a rate of proportionality compared to the total population. MARSS also allows to include an observation error. –> Estimate of historic abundance. 1980s millions of butterflies, 2000 only thousands. Something happened in the 90s. Population decline is ~7% per year. In 2018 counts dropped again. We have never had anything close to this low. Yet, it might just be ordinary fluctuations in the environment. If we loose a few hundred butterflies in a population of several millions, the population will persist. However, if we loose a few hundreds in a population of a few thousands, this population might eventually go extinct due to the extinction vortex. So Elizabeth applied for emergency funding from the NSF. Is anybody looking for an awesome postdoc position??? What caused decrease: Climate (temperature, precipitation)? Everybody always thinks first it is climate change. Pesticides. Habitat loss. Overwintering habitats along the coast have become smaller due to housing development and dryland farming. How do we know which factors really drove the population decline? Don’t do linear modeling with so many correlated variables. Instead: PLSR: Partial Least Square Regression. This analysis can handle a large set of variables. Retains uncertainty about which variable is correlated with outcome. Similar to PCA. Relative importance of different variables for 1st and 2nd components (axes). What did the model spit out? Summary: Land development, glyphosate, and nicotinoids all correlated negatively with butterfly numbers. With regard to the drop in 2018, it could be attributed to the cold and wet months of February and March. They had been bad for butterfly recruitment. Not just climate change – land use matters. And use of pesticides by everybody, farmers and hobby gardeners. This is a large landscape scale problem. Not just butterflies. Many other insects are suffering from the same problem. During the questioning session in the end: Some monarchs don’t migrate. They sit on perennial milk weed their whole life. These populations are common in Southern California and Mexico. In Central and Northern California, populations are migratory. Don’t buy perennial milkweed in the store and plant them in the garden. They might invite butterflies to become stationary and then infected by parasites. Indeed, stationary populations have higher parasite loads! Buy endemic milkweed to support Western butterflies and plant them early in the season. Thanks. And a little side note: Elizabeth is an awesome presenter. She must be a really great teacher. Thanks for entertaining us.